Scott Olson/Getty ImagesAustin Police Department Chief Brian Manley. 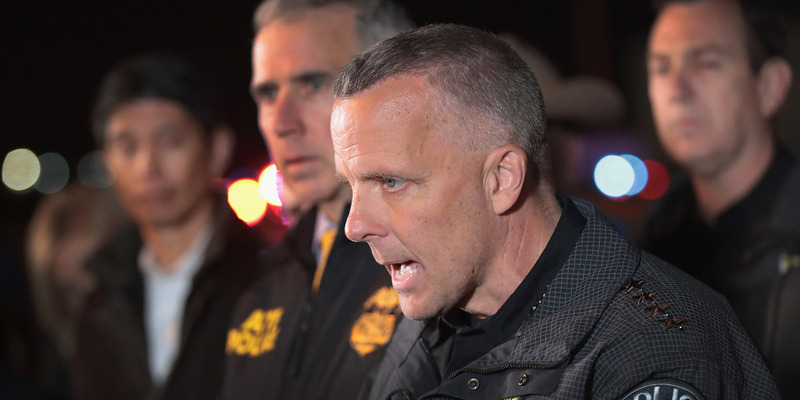 Austin Police Chief Brian Manley said the bombing suspect who terrorised the neighbourhoods in the Texas capital over several weeks in March left a 25-minute recorded message on a phone. Manley says investigators are treating that recording as a confession. The suspect, Mark Anthony Conditt, killed himself by detonating a bomb inside his car early Wednesday as law-enforcement closed in on him. Police say they haven’t yet pinpointed a motive for the bombings, which have killed two people and injured five others. Police in Austin, Texas, say the bombing suspect who terrorised the local community around the state capital in March left a 25-minute recording on a phone. They are treating that recording as a confession. Manley said Conditt’s message was “not at all reflective of either a hate-based or terrorism-based approach to what he did.” He said that the suspect gave no reasons for why he chose his victims. The recording describes the bombs that Conditt constructed, including the “similarities and differences” between the devices. Manley said the descriptions allowed investigators to conclude that all of the bombs linked to the suspect have been accounted for. Conditt killed himself early Wednesday morning by detonating a bomb inside his car as police closed in on him, ending a weekslong series of explosions that killed two people and injured five others in an around Austin, Texas.